By now, you’ve surely come to understand that video is very much the name of the game when it comes to online content. Whether you post little video clips of your day to your Instagram stories or you put together carefully-edited cinematic experiences (or vlogs) on YouTube, we know that video is the way to go. And yes, you could easily invest thousands of dollars in expensive camera equipment to get the best possible image quality, but many people also make do by simply using their smartphones. And that’s okay too. We all have to start somewhere and the cameras on modern smartphones have gotten really good. But do you know what is one of the most frustrating things you’ll ever see in an online video? When someone simply points their camera at a computer screen. It’s nowhere near ideal, whether it’s to create an online video course on Udemy or to showcase their gaming prowess on Twitch. That’s not the way to do it. If you’ve got yourself a Mac, you need to get some screen recorder Mac software that can easily and precisely capture what’s on your display. What you need is Screen Recorder Studio by Movavi. You can start recording with just a single click, capturing live streams and webinars for later viewing, recording your desktop apps for video tutorials, and putting together your own unique video clips for sharing online. Part of this could be for entertainment purposes, most assuredly, but the applications for Mac screen recorder software can have much more serious applications too. For example, a great set of guidelines was published by the University of Waterloo, outlining some of the best practices for screencasting in an instructional or educational environment. But where you can really go above and beyond the basic screen recorder Mac software is with the ability to edit right from within Movavi Screen Recorder Studio too. It’s a 2-in-1 software solution that leverages the company’s proven ability to supply a great video editing program, combining it with live screen capture. What’s great is that you can record video from your screen and from your webcam at the same time, making for a more personal interaction with your viewers as well. Take advantage of creative video effects like chroma keying (green screen), picture-in-picture and even slow motion, adding in background music, captions and other video elements to your heart’s delight. 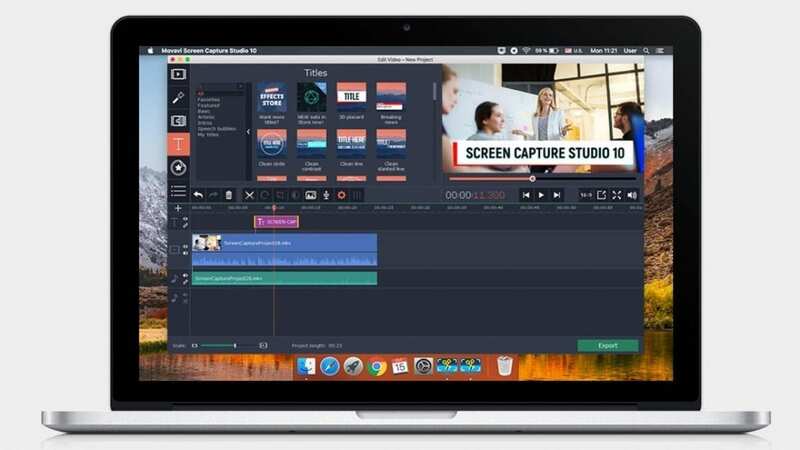 Through this combined Mac screen recorder and video editor, you can add in your audio narration and captions after the fact if you’d like. While recording, you can also select just the portion of the screen you’d like to capture, which makes it really convenient to keep your presentation notes “out of view” of the captured area. The video can then be subsequently divided into segments and cut seamlessly with transitions too. This gives you the opportunity remove unwanted footage too. This is also where you can toy around with the abundant special effects and filters. When you’re done, export the video as an MP4, MOV, AVI, or other popular file format, and then share it on your platform of choice. And that’s it. Screen recording (and video editing) have never been so easy. Get started by downloading the free trial today. Promotional consideration for this post was provided by Movavi.